On Tuesday there was a snow day in St. John's and I escaped to Vancouver where it was spring. 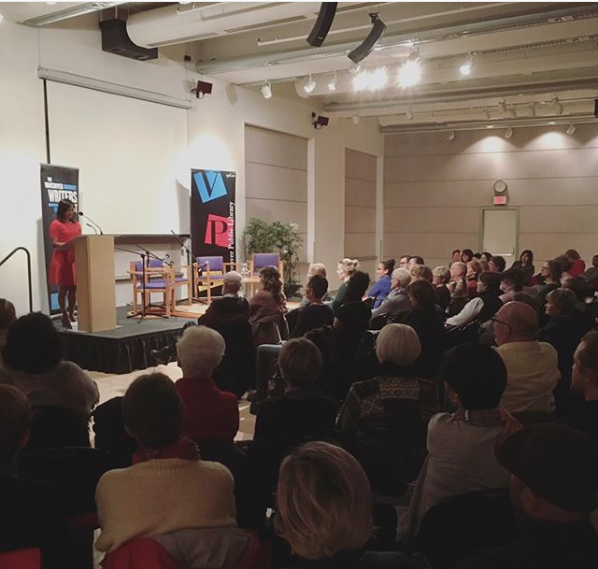 I was there, of course, for the Incite: New Voices of CanLit event at the Vancouver Public Library. 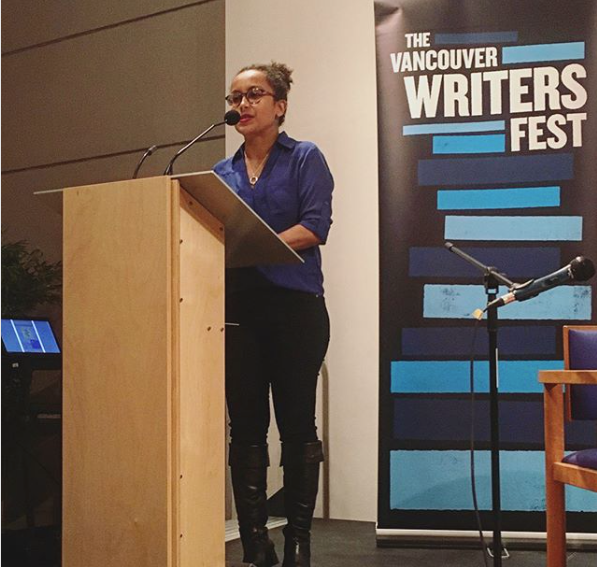 Three cheers to the Vancouver Writers Fest for putting on such a stellar event. I was especially impressed with how well they curated the authors. I had never met Kim Fu, Guillaume Morissette or Djamila Ibrahim before but the four of us had a great chemistry on and off stage. That doesn't often happen. (And we spontaneously colour coordinated with the library's colour scheme...ha!) It was really special to be at the Vancouver Public Library too because in The Boat People's fictional Vancouver, 350 West Georgia is the site of the Immigration and Refugee Board Building. As my editor Anita said: reading in that space was like bringing the story home. 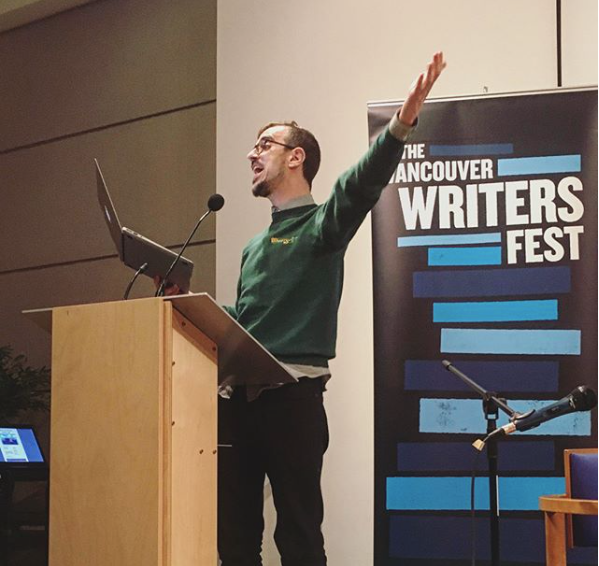 Photos yoinked from the Vancouver Writers Fest's instagram account. My publicists took full advantage of my visit and packed the schedule with interviews and appearances. I began Wednesday with something better than coffee: a taping of Can't Lit with the hilarious, vivacious, sharp- tongued duo of Jen Sookfong Lee and Dina Del Bucchia. (I'll post an update when the episode is live.) I've been listening to Can't Lit for a while so being a guest was a real treat. 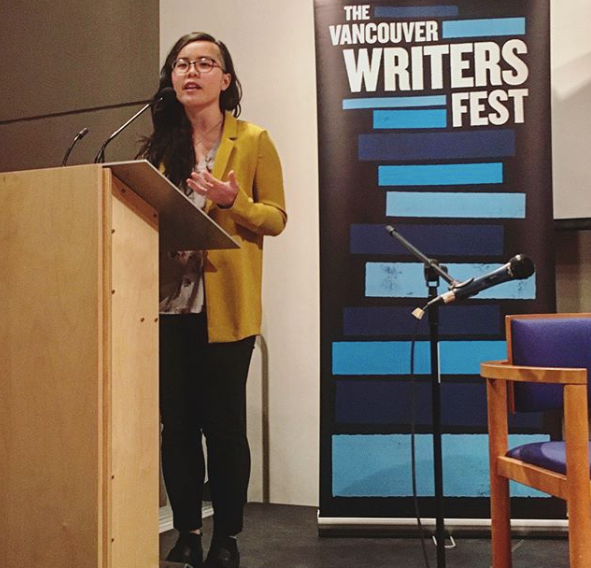 While I was in town, The Tyee ran a review of The Boat People. It was a wonderful, hilarious piece by Crawford Kilian but BE WARNED: THERE ARE MAJOR PLOT SPOILERS. If you've already finished the book, you are safe to read the review here. I love the classification of The Boat People as 'political horror.' Yes. It is horrific. Parenthetically, I hadn't actually realized I'd written a political book until quite late in the game. One day, I was walking down the street listening to a podcast where some foolish (male...natch) person was opining: "women don't write political books." And I thought: "don't we? wait a second...I did!" Back to Vancouver! While there, I also taped an episode of CBC's North by Northwest with Sheryl Mackay and an interview with Joe Planta at thecommentary.ca. Stay tuned for links when both those interviews go live. 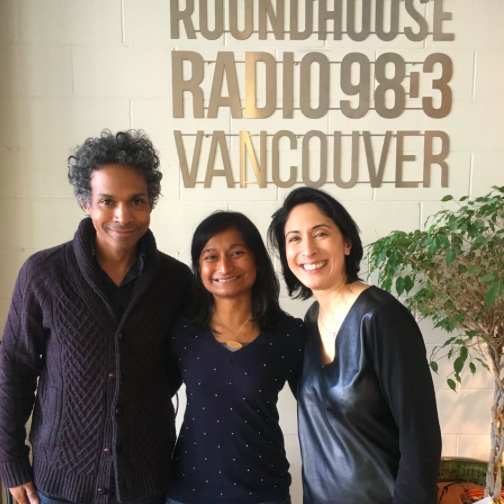 And finally, my very last interview was a long chat with Minelle Mahtani for Roundhouse Radio's Sense of Place (available now so go have a listen). They have a segment called "Acknowledgements" where they bring in an author and someone they thanked in their acknowledgements page. David, me, and Minelle. Photo courtesy of Roundhouse Radio. On our way to Roundhouse, my publicist Laura promised this would be one of my favourite interviews. She wasn't overselling. Minelle is an incredible interviewer. She asks deep, thoughtful questions and knows how to get at the big stuff, the emotional stuff. Plus she listens. I mean really listens. Two thirds of the way through our interview we brought in Lisa Moore. The conversation was wide-ranging. We discussed dialogue, location, language, bigotry, bureaucracy, and found a similarity between my novel and Lisa's February. And bonus: David Chariandy dropped by, unexpectedly, to eavesdrop. Knowing that both Lisa and David were listening in to my chat with Minelle wasn't at all nerve-wracking....nope, not at all! In all seriousness: what a lovely way to cap off my time in Vancouver, speaking with Minelle and Lisa and David and listening to them discuss literature with each other. And did I mention it was spring in Vancouver, my favourite Canadian city? So lovely. Please invite me back! ps. The Boat People was #1 on the CBC's Bestseller list last week and #5 on the Globe & Mail's list.